Home » Foolproof or Fullproof – What’s the Difference? Compounds are words that are made of two smaller words that have been joined together. Flowerpot is a compound of the words flower and pot, for example. Waterproof is a compound of the words water and proof. Any part of speech can be compounded, including nouns, verbs, and adjectives. The word foolproof is a compound word that is structured similarly to waterproof and also functions as an adjective in sentences. You may have seen a similar word, fullproof, in unedited writing, but which version should you use? 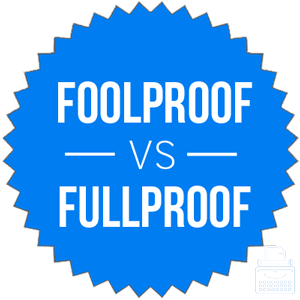 What is the Difference Between Foolproof and Fullproof? In this post, I will compare foolproof vs. fullproof. I will use the correct version of this word in several example sentences, so that you can see how it appears in the proper context. I will also demonstrate a memory trick that will help you choose foolproof or fullproof correctly every time. What does foolproof mean? Something that is foolproof is incapable of going wrong. Foolproof itself is an adjective; it modifies nouns by describing one of their qualities. Plans are often thought to be foolproof (until they fail), and a process that operates so simply that it cannot be performed incorrectly might also be thought to be foolproof. I have devised a foolproof plan to rule the world with my dog by my side. The politician thought his scheme was foolproof, but now he is in jail. Foolproof is similar to other adjectives, like waterproof and fireproof. Something that is waterproof cannot be damaged by water. Likewise, fools cannot damage something that is foolproof. This compound word is a relatively recent addition to the English language, having been first recorded at the beginning of the 20th century. What does fullproof mean? Fullproof is a mistake some writers make when they actually mean to use foolproof. It’s easy to understand why: full and fool are near homophones, and many English speakers do not pronounce words accurately in informal use. A writer who may not have been familiar with this adjective could easily have misheard it and written fullproof instead, thus creating a new source of confusion for future writers. Foolproof means immune to fools, just as waterproof means impervious to water. By the same rules, fullproof would mean impervious to full. As you can see, this meaning doesn’t make much sense. There are no contexts where fullproof is considered correct. It would always be seen as a spelling error by editors, college instructors, and your readers generally. As such, you would do well to avoid it. Only foolproof is a recognized English word, so it’s really your only choice here. Fullproof is a misspelling. Since fool and good each have a double O, you can easily remember that using foolproof instead of fullproof is always good practice. Is it fullproof or foolproof? Foolproof is an adjective that means impervious to damage at the hands of fools. Fullproof is a spelling mistake based on the similar pronunciations of the words fool and full. Foolproof is the correct spelling. Fullproof is a spelling error. 1 What is the Difference Between Foolproof and Fullproof? Formulas or Formulae – Which is Correct?